Queen’s We Are The Champions Needs to Rock the Next Super Bowl!! You are here: Home / Uncategorized / Queen’s We Are The Champions Needs to Rock the Next Super Bowl!! There’s no better sports anthem than We Are The Champions! 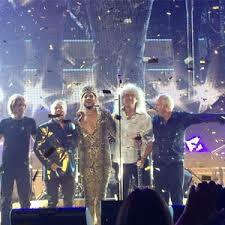 Let’s get Queen+Adam Lambert to rock the next Super Bowl with it! Join the petition!! NFL Commissioner and Board Of Directors: Get Queen + Adam Lambert to perform LIVE at Super Bowl 2017! – Sign the Petition! Every time this year’s Super Bowl was advertised “We Are The Champions” was used. Yet who was the musical entertainment? Coldplay, Beyoncé and Bruno Mars! Very misleading! Luckily, next year (2017) is the 40th anniversary of “We Are The Champions” and “We Will Rock You” – two songs that deserve to be performed LIVE by Queen + Adam Lambert. Were this to happen, even I would watch it – as would many fans of both Queen and Adam Lambert who wouldn’t otherwise. I belong to a huge community of Queen + Adam Lambert fans. We are all distraught that it is not happening this year, as it’s the 50th. Who better to give the audience proper LIVE stadium rock? In the 40th year of the songs, it’s fitting! Actually, the game played in 2016 was the 50th Super Bowl but 2017 will be the 40th anniversary of We Are The Champions & We Will Rock You. I definitely want to see Queen+Adam Lambert rock the Houston house at the next Super Bowl! So do I Carol. Last year was very disappointing to me. This would make up for it. People LOVE Queen and will freak out when they hear Adam. So——————-I signed the petition. What else do we have to do to make this happen??? Should have happened years ago ! Sounds like a REAL GREAT IDEA!! Should have been done long ago! !